Dani Richardson is living the dream. A corporate lawyer pursuing the case that could make her whole career, married to the man of her dreams with a beautiful child to boot, Dani knows this is the life she’s always wanted. What she can’t quite figure out is why she is so desperately, quietly miserable. 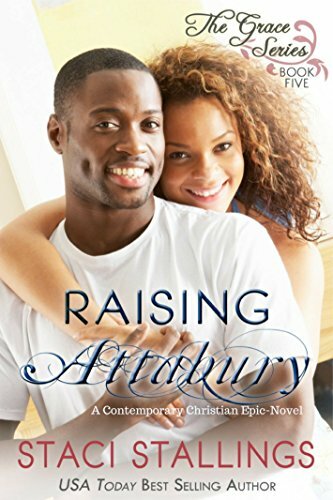 The fifth and final novel in the epic Grace Series, “Raising Attabury” takes the reader on a decidedly different type of romantic journey that’s less about discovery as it is about rediscovery. This novel, written by USA Today Best Selling Christian novelist, Staci Stallings, explores Christian themes of forgiveness, hurt, healing and hope. It is the story of the every-marriage, the one that’s just going through the motions, trying to stay together and wondering if it’s even worth the effort. In these pages, you will find hope. You will find real life. You will find peace as you read of characters who do not have perfect lives, who make mistakes, and who ultimately experience the life God truly has in store for each of us if we can find the courage to surrender to His plan for our lives.